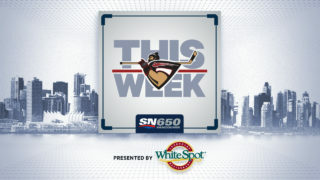 Saturday night in front of 4200-plus at the Langley Events Centre the Vancouver Giants (25-12-2-0) kicked off their 2019 home schedule with a 7-4 victory over the visiting Kamloops Blazers (15-22-2-1). 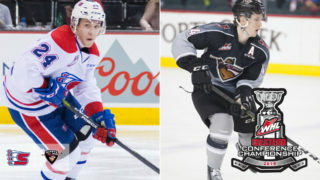 Bowen Byram paced the Giants offense with two goals and three assists, setting a new single-game franchise record for points for a Giants defenceman. 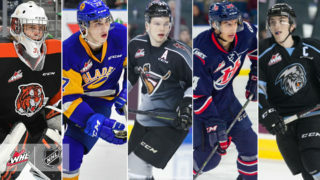 Milos Roman added a goal and three assists and Davis Koch and Tristen Nielsen each had a goal and two assists for Vancouver. Jermaine Loewen responded with two goals for Kamloops. 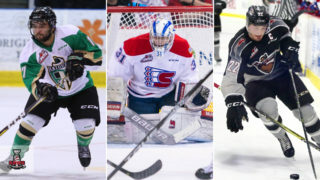 Between the pipes, Trent Miner stopped 24 of Kamloops’ 28 shots while the tandem of Dylan Ferguson and Dylan Garand stopped 31 of 38 Vancouver shot opportunities. The win for the Giants coupled with Victoria’s loss in Everett moved the Giants seven points ahead of Victoria for first place in the B.C. Division standings. It was the second win in a row for the Giants altogether. VAN – Bowen Byram (11) scored his 11th of the season off a Milos Roman rebound at 2:32. KAM – Jermaine Loewen (13) answered for Kamloops 58 seconds later to tie it 1-1 at 3:30. VAN – Bowen Byram (12) buried his second of the period off a one-timer at 9:05. VAN – Milos Roman (18) knocked home his own rebound on a power play at 11:59 to make it 3-1. KAM – Travis Walton redirected home a feed from Kobe Mohr at 17:02 to move Kamloops back within one. VAN: – Justin Sourdif (10) whacked home a Milos Roman rebound 46 seconds into the period to make it a 4-2 game for Vancouver. Bowen Byram had the second assist. VAN: Tristen Nielsen (5) ripped home his fifth goal of the season through traffic at 2:15, spelling the end of the night for Kamloops starter Dylan Ferguson. VAN: Brayden Watts (10) made it 6-2 when he beat Dylan Garand glove-side from the left-wing circle. Bowen Byram and Milos Roman assisted. VAN: Davis Koch (12) extended the Giants lead to 7-2 when he tipped home a Tristen Nielsen feed at 16:16. Bowen Byram had the second assist, setting a new Giants record in the process. KAM: Kobe Mohr (5) beat Trent Miner with a snap shot from the left-wing circle on a power play at 6:35. KAM: Blazers captain Jermaine Loewen (14) notched his second of the night on a wrap-around at 11:31 to round out the game’s scoring. 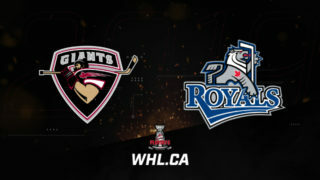 Next Giants Game: Tomorrow at 4 PM against the Victoria Royals at the LEC. 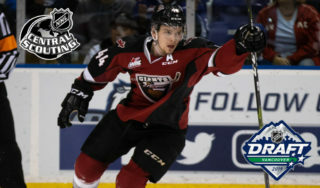 With two goals and three assists, Bowen Byram became the first Vancouver Giants defenceman to ever record five points in a single game. Several others including: Jonathon Blum, Kevin Connauton, Neil Manning, Cody Franson and Paul Albers all had four points in a single game. Bowen Byram now has recorded points in five straight games. During that span he’s notched three goals and seven assists for 10 points. He leads all WHL defencemen with 12 goals. The Giants are now 3-0 against Kamloops this season. All three victories against them have come at the LEC. The Giants will still face Kamloops five more times over the course of their next 23 games. Saturday’s game marked the home debut for the three newest Giants: Dallas Hines, Seth Bafaro and Jadon Joseph.